Formenek Spruce is a weeping spruce in the Norway Spruce family. It typically only gets 1.5' to 2' tall when it is not staked. It will grow from 3' to 6' wide sprawling over the ground. This plant is perfect for using as ground cover or spilling over a wall. It is a fairly rapid grower. If you prefer the weeping look, stake the tree and it will get about 5' to 6' tall. You can then let it spill over to weep. It has dark green needles that keep their color through winter. It is drought tolerant when established. It is also deer resistant. 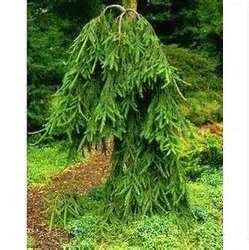 Formenek Spruce likes to be planted in full sun or partial sun.